Todd Pitcher of Semibold digital marketing agency writes about his experience of a successful print marketing offer. Sometimes it’s the little things that make the difference in the world of sales and marketing. Just standing out slightly can be the difference between making a sale and losing a potential customer. Topshop in Norwich provided me with a terrific example of this just a couple of weeks ago. I was being (reluctantly) dragged around Norwich with my other half in the January sales. Every shop offered “X% off everything”. Not Topshop. When arriving at Topshop in Norwich there were no signs of a shop-wide sale. However, when we walked into the store a member of staff greeted us with a small green business-card-sized 20% discount voucher. 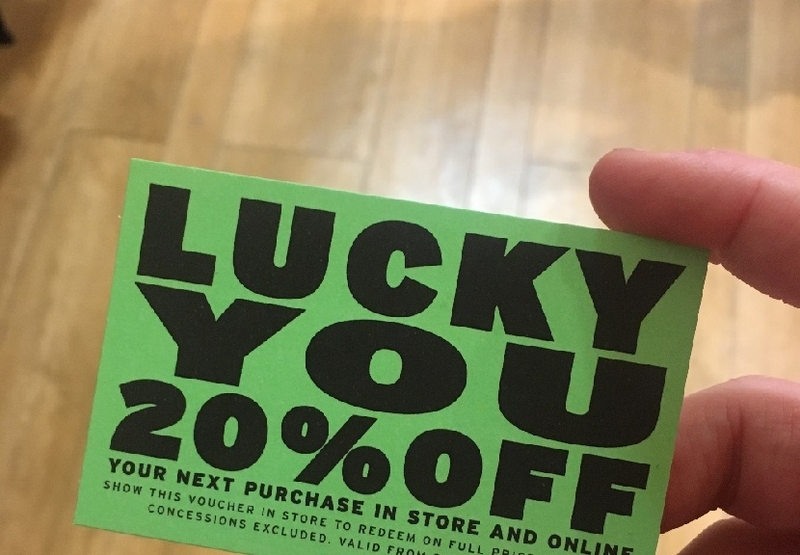 The voucher gave you 20% off anything in the whole store and expired within a short period after we were given the card. Now, this may not sound like the most exciting bit of marketing in the world, nor something that’s entirely original, but it fascinated me. Topshop giving me and my partner this discount card created a sense of urgency and made the discount seem exclusive. If we would have walked into the Topshop store and everything had been on sale, we would’ve felt no reason to purchase. However, being handed a physical discount with an expiry date increased our motivation to purchase. Once again, if there had been a store-wide sale we would’ve felt no different to any other shopper. But being handed a voucher made us feel like the discount was exclusive, once again encouraging a purchase. First of all, yes we did purchase from the store. Of course, I’m not claiming that the discount voucher was 100% the reason for this, but I’m convinced it influenced the buying decision fairly heavily. This little example I picked up reminded me how making your marketing and sales technique just a little bit different and personal can be the difference between making a sale and losing a customer. At Colour Print, we offer a full printing service from design to distribution. We can provide print services for creative marketing such as these discount cards at a very competitive price. To talk to us about a print project, call us on 01603 488001 or email sales@col-print.co.uk. For regular articles on print and printing, follow us on Facebook and Twitter.